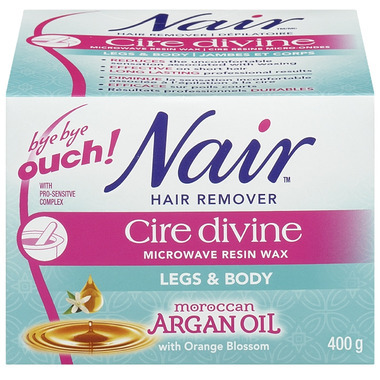 Nair Cire Divine Microwave Resin Wax with Moroccan Argan Oil means 'bye bye ouch!' and it's safe for even your extra sensitive areas. for Legs & Body. This Nair wax sticks to the hair instead of your skin so it less painful than normal waxing. It works on hairs as short as 2 mm with lasting results up to 4 weeks. I found this worked well. I believe it did hurt less than other waxes (used it around my bikini region). Definitely will repurchase. The only downside is I find the wax is thinner in consistency so it drips a lot and when one goes to pull the wax off, it occasionally breaks in pieces. I believe that is caused by not applying a thick enough strip but anyway, quite pleased with this wax. Found this actually made waxing hurt more. Buy the original Nair strip-less wax and save yourself a few dollars. It smells a lot nicer though.